Michael Iovanna, the president of the auto dealership group based in Lynn, Massachusetts, died in a fatal crash that also killed Chester Hincman in Middleton, friends of Iovanna told NECN. 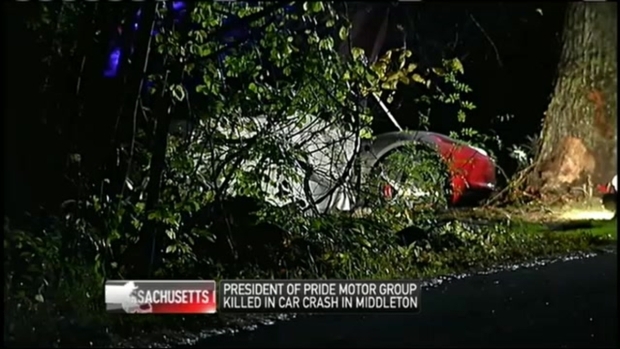 The president of Pride Motor Group based in Lynn, Massachusetts, was killed in a crash in Middleton Sunday night, friends of the victim confirmed to NECN on Monday. President Michael Iovanna, 50, of Middleton, was driving the Ferrari with 40-year-old Chester Hincman of Danvers when it spun out and hit a tree, bursting into flames. Middleton Police Chief James DiGianvittorio said fire shot as high as 30 feet in the air after the crash near the intersection of Peabody Street and Bow Street, near Iovanna's Mill Street home. A neighbor described hearing a rocket-like sound before a loud crash. When he ran outside his house, he said the car was on fire. Michael Iovanna, the president of the auto dealership group based in Lynn, Massachusetts, died in a fatal crash that killed one other male victim in Middleton, friends of the victim told NECN. "One of the homeowners called us to let us know that the accident happened," said DiGianvittorio. "It appears that it went off the road, spun out and burst into flames." Police did not know how fast the Ferrari was traveling, but the speed limit on the road is 25 miles per hour.